It was more than love that led them down the aisle. 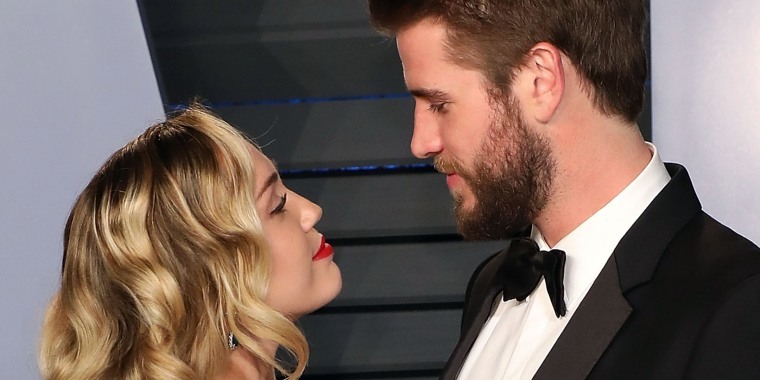 Over the course of a decade, Miley Cyrus and Liam Hemsworth met, dated, split up, dated again, got engaged, broke up again and reunited — all before finally taking the leap and tying the knot in December. So what changed? Why did a trip down the aisle seem like the right step for the couple after so much uncertainty? In a cover interview and essay for Vanity Fair magazine, Cyrus opened up about that and pinpointed the sad moment that prompted them to choose a life of happiness together. It all goes back to last November, to the Woolsey Fire that scorched almost 97,000 acres of land in California's Los Angeles and Ventura Counties and destroyed 1,500 structures — including the home Cyrus and Hemsworth shared in Malibu. "Losing my home, losing that peace, was very unsettling," she explained of the devastating event. "I didn’t go back. I felt like my roots got ripped from under me." But that wasn't all she was left feeling. Amid the pain and heartbreak both she and her then-fiancé experienced, she also felt a renewed sense of self. "I’ll never be happy that all those memories and pictures and things that I’ve loved are gone," Cyrus said. "But to have an experience like this — I find myself feeling more connected to being human again." And especially more connected to one other human in particular. "When you experience what we experienced together with someone, it is like glue," she said of the loss she and Hemsworth endured. "You’re the only two people in the world who can understand." They "found a new bond underneath all that rubble," she added. With their house gone, the "Younger Now" singer suddenly discovered her real home. "My relationship is very special to me; it is my 'home,'" the 26-year-old noted. "I feel less misplaced when we are in the same room, no matter where that is ... What Liam and I went through together changed us." "I’m not sure without losing Malibu, we would’ve been ready to take this step or ever even gotten married, who can say?" she mused. But they're both glad they took that step. Hemsworth recently sat down with our own Willie Geist for an interview on Sunday TODAY, and raved about his new bride. "I feel really happy, and really fortunate to be with such a great person," the "Isn't It Romantic" star said. "We've been through so much together over the last 10 years, so it felt like it was time."